Nov. 9 was a cold and rainy day, but that didn’t stop Lab leaders and employees across the U.S. Department of Energy’s (DOE) Brookhaven National Laboratory from gathering for a ceremony that would honor our veterans. The ceremony was a little different from those organized by the Brookhaven Veterans Association (BVA) in the past. 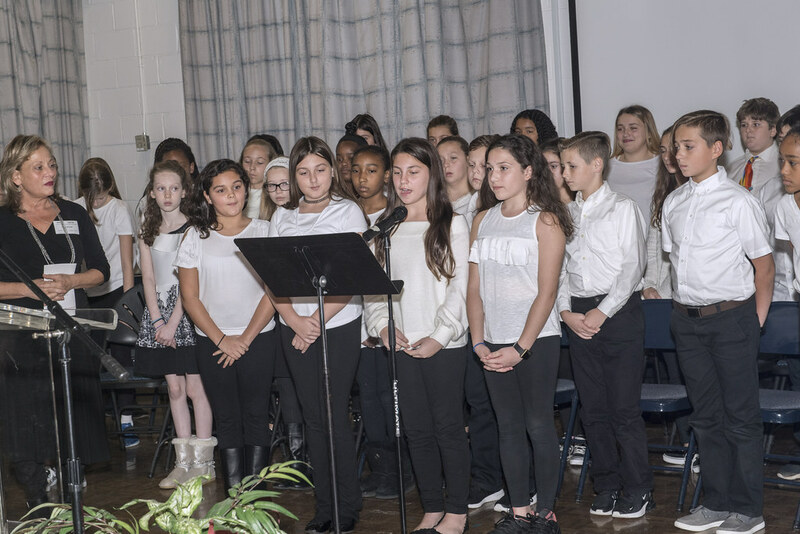 This year, to add a special touch to the ceremony and commemorate the 100th anniversary of the writing of God Bless America, nearly 75 sixth-grade students from Longwood Middle School chorus were invited to participate. Led by their music teacher Sandra Palminteri and Longwood music director John Gallagher, the students performed two songs during the ceremony — the national anthem and God Bless America. The latter song holds a special place in history at Brookhaven Lab. God Bless America was written 100 years ago by a young Army recruit named Irving Berlin while he was stationed at Camp Upton — the site where the Lab is today. History says that Berlin wrote God Bless America for his play, “Yip, Yip, Yaphank,” but changed his mind and decided not to include it because it was too solemn. Years later, he brought out the lyrics and music and asked Kate Smith, a well-known singer of that time, to perform the song. Although Smith already had a popular radio show, she sealed her legacy when she sang the song as part of her radio broadcast on Armistice Day, November 11, 1938, which marked the anniversary of the end of World War I. During the BVA ceremony, the traditional memorial wreath was placed by Lab Director Doon Gibbs and DOE Brookhaven Site Office Manager Robert Gordon. Congressman Lee Zeldin gave brief remarks, highlighting accomplishments of the Lab while reminding the young students about the meaning of Veterans Day. Zeldin served in the U.S. Army and currently serves as a reservist. Using a flag that had been flown over the Capital in Washington D.C., honor guards representing all five branches of the military performed a customary flag-folding ceremony and presented the folded flag to Congressman Zeldin. Four students who had family members stationed at Camp Upton were recognized during the ceremony. At the request of Palminteri, Don Farnam, an employee in the Lab’s Facilities and Operations directorate and a past commander of the BVA, gave the students a tour of the memorial boulders that are displayed at the base of the American flag just outside Brookhaven Center. Shirley Kendall, manager of the Lab’s Diversity and Inclusion Office and the current commander of the BVA, concluded the ceremony.